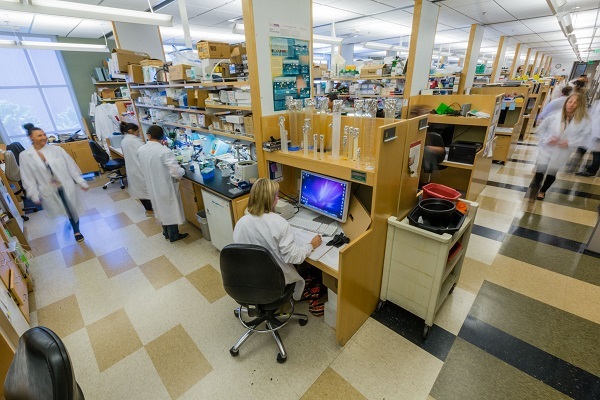 The Saban Research Institute building and Smith Research Tower provide more than 150,000 square feet of bench laboratory space dedicated to research conducted by more than 450 research faculty who collaborate with clinicians in all sub-specialties across the hospital. Laboratory scientists are supported by sophisticated shared core facilities that include: genomics, gene targeting and pathology, proteomics, biostatistics, cellular imaging, fluorescence activation cell sorting (FACS), single cell and next generation sequencing), stem cell, vector and research imaging. The Clinical Research Support Office at Children’s Hospital Los Angeles provides resources that enable investigators to perform high-quality, patient-oriented research at various venues throughout the hospital and the community.